James Harden's 61-point eruption against the San Antonio Spurs left Mike D'Antoni to marvel at what the Houston Rockets coach dubbed "one of the best performances". Harden rallied the Rockets from a six-point deficit with four minutes remaining, scoring 13 consecutive points - including three successive triples - to rescue a 111-105 win for Houston. The reigning NBA MVP hit 27 points in the first quarter and went on to join Wilt Chamberlain, Kobe Bryant and Michael Jordan on the list of players to register multiple 60-point games in the same season. 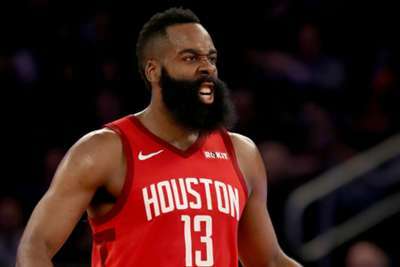 Harden, who also had 61 points against the New York Knicks in January, tied Jordan and Bryant for the most points in a two-game span over the past 50 seasons, his efforts on Friday taking him to 118 following the 57 he racked up against the Memphis Grizzlies two days earlier. "I don't know how you get any better," D'Antoni said. "Whoever was in the gym tonight probably [saw] something they have never seen before. "There's no way. That was one of the best performances - the magnitude of the game, we needed it - just everything. I don't know how many points he got in the last four minutes, but we were down. The guy was playing." Giannis Antetokounmpo is seen as the favourite for this year's MVP, but Harden's team-mate Chris Paul is in no doubt this performance solidified his status in the race for that honour. "I mean, what else have you got to do? This was tough, this was crazy," Paul said. "I keep thinking about a conversation I had with Paul Pierce after his last game when I was with the Clippers, and talking about having an opportunity to appreciate greatness. Sheesh, that's tough. Not only that performance, but we won. We needed it." "Some of the shots he hit today, it's remarkable," guard Gerald Green added. "I've seen a lot of basketball in my life, played against a lot of people, and his talent level is just something that I've just never seen before. "The only person that could probably guard him is the coaches and the referee. That's it. There's nobody that can stop him. He's just one of those types of players that he's able to get a shot off at any time. "He doesn't have any weaknesses. The only person that can stop him is [D'Antoni] if he takes him out, and the referees if they foul him out. That's it." The Rockets are third in the Western Conference at 46-27, with the Spurs occupying the eighth seed at 42-31. "We gave up a million points in the first quarter, and they had 19 free throws in the first half and none in the third quarter," said Spurs coach Gregg Popovich. "You play with your heart and you play between the ears also. "We played smarter and we played harder in the second half, but you can't do that against a good team like Houston or any team in the NBA. We played the last two quarters, and then at the end, James put on an MVP-type performance. So that's that."